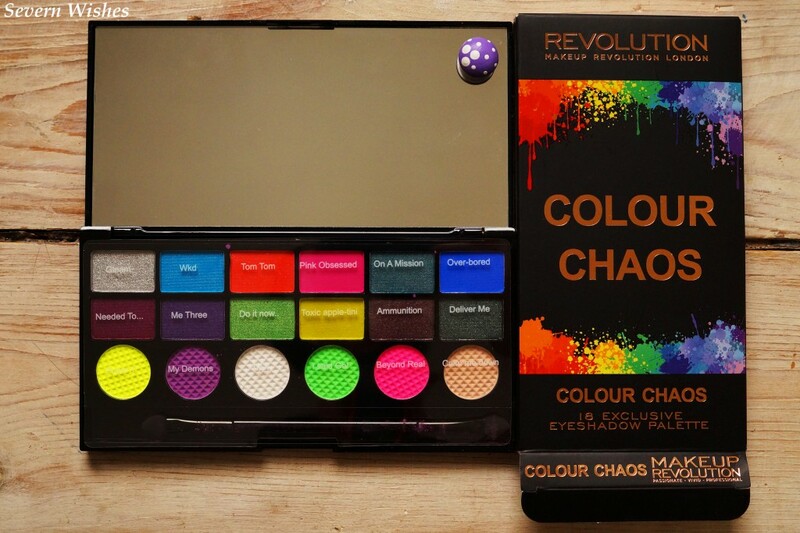 I was lucky enough to receive this incredible palette from Makeup Revolution London in my mystery bag in March. If you saw my mystery bag reveal here on my blog then you’ll remember it. I wanted to swatch this one and really test out the vibrancy of the colours. At first glance you can see how pigmented the shades are, especially some of the shimmer colours with glitter for extra sparkle. I really wanted to review this item because I don’t often wear bright colours on my eyes so it’s a new aspect of makeup for me to try. With 18 exclusive shades inside this palette there is so much choice. When you initially open the palette you instantly notice how pigmented the eye shadows are. They are all titled from Makeup Revolution London and the plastic sheet is easily removable and then re positioned after each use. The pro two ended brush that is included is soft and seems durable. The brush tips are small ideal for getting into the edges of your eyes. 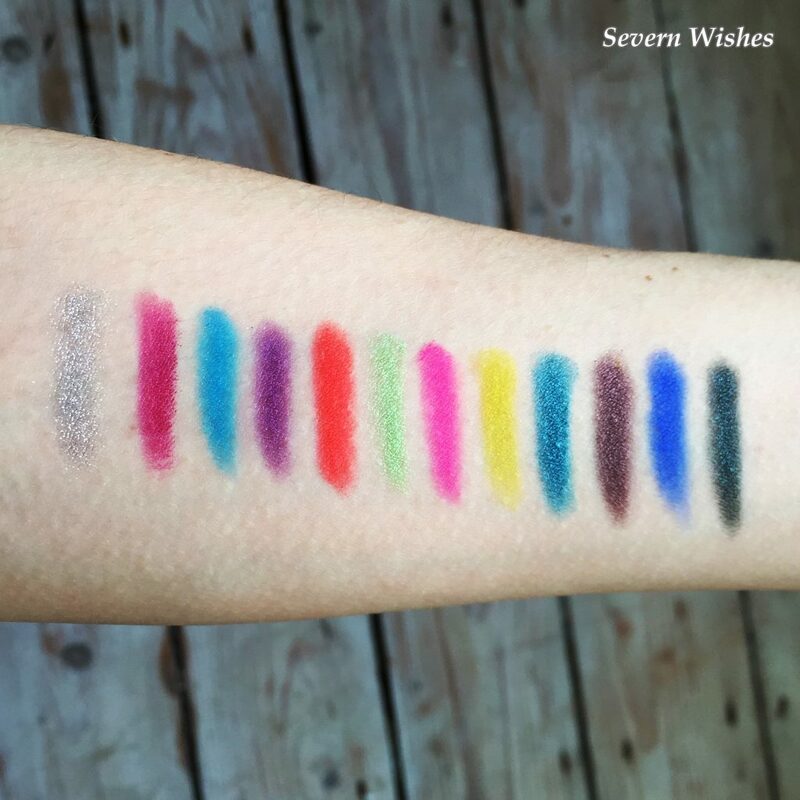 Here are some photographs of the palette itself and then some swatches on my arm too, before I give my overall review. I took these photographs in natural light to show the true pigment of the shades and give you the correct colours as expected in the palette. My swatches run from left to right and top to bottom. 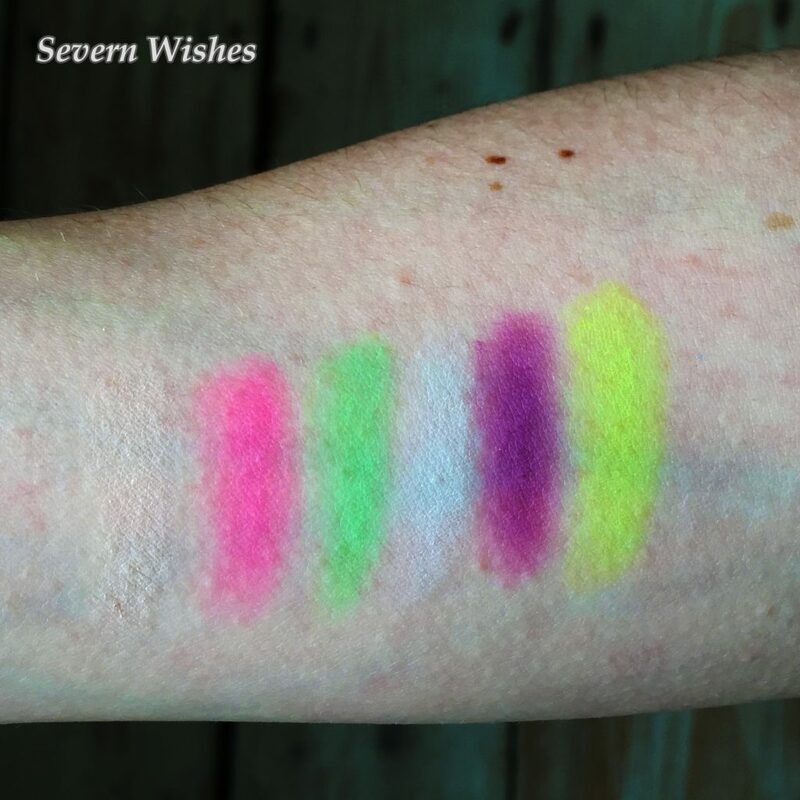 Example; Gleam, Needed To, Wkd, Me Three, etc, The six matte shades are on my other arm so they can be viewed separately from the shimmer shades. Here are the 12 shimmer shades of eye shadow. I particularly like the darker shades, because that is how I would usually do my makeup style. As you can see from my swatches there are differences between the shades even those of similar colour like the blues. Luckily I think there are palettes that suit everyone, and there are palettes that people may use only a few of the colours included. I wouldn’t reach for the majority of these shades on a daily basis, but they are great for themed makeup and fancy dress nights out, or just matching with a bold outfit. The great thing about a set like this one is that those shadows are there when you need them, and you can use your regular palettes for the regular days of the week. 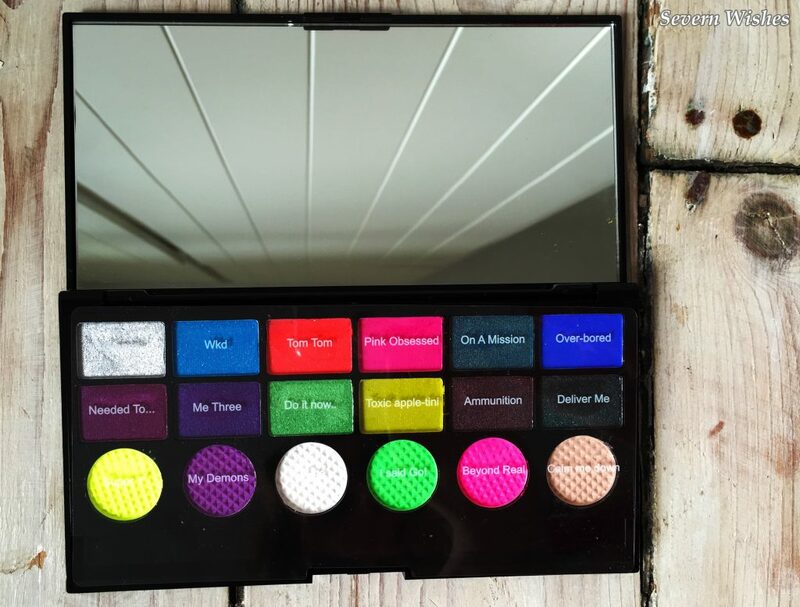 Unless you love bright and bold as an everyday look in which case this palette is certainly for you! 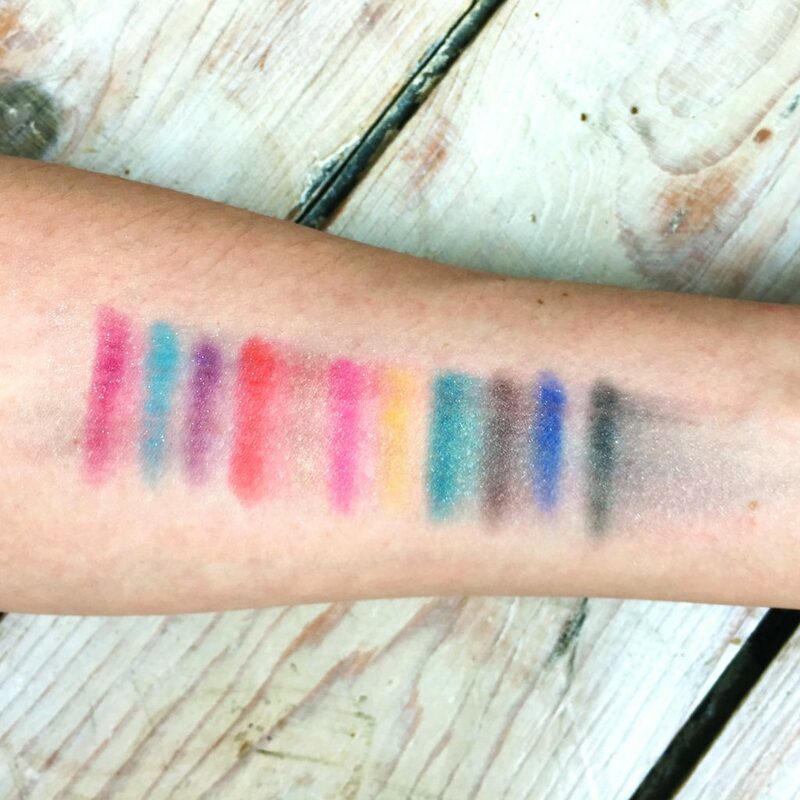 The matte shades contain 4 bright and 2 light colours. You can barely see the beige colour (left on my photograph). This is great as a primer for your eyelids before adding other colours to blend, or even as a lower lash line highlighter, which is probably what I will be using this and the white colour for. As you look at the palette I have gone from right to left with these swatches. I decided to test the staying power of these shimmer eye shadows by rubbing my arm one way with a piece of tissue. I did this for a few seconds and was astounded to see that most of the colours remained intact. I in fact needed two cotton pads of Garnier Micellar water to get this stuff completely off! So it has great staying power I think! 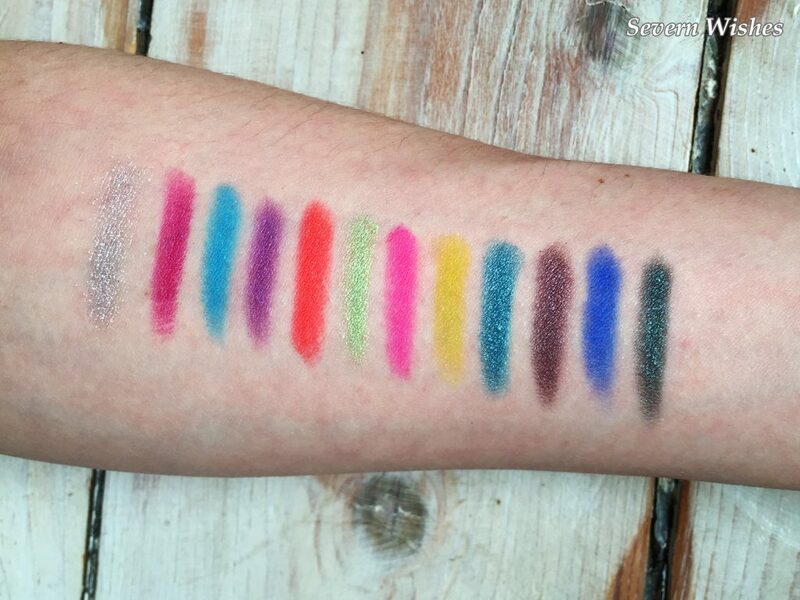 As you can see from my images of swatches the overall quality of the palette is great. The shimmer shades are a little dusty but once you have blown off the excess you will see a wonderful shade that is left. The pigment is wonderful but they are quite fragile. That is my only reason for giving it a 4/5 for the quality. The actual variety that you get is great for such a small piece of kit and I think the range is one that would suit most people. I myself do prefer the dark shades such as ‘Me Three’ and ‘On A Mission’ but you also have the bright and bold to go specifically with outfits or themed makeup nights. Electric Blue Eye Shadow is currently on trend so I might have to give that a go next time I wear one of my nautical outfits! I gave the value a 5/5 because although I received this palette free you can pick one of these up for around £6 (sometimes lower), and I think that’s a fabulous price for all the content you get in this palette. I am very pleased that I was lucky enough to receive this palette, and although it won’t be the one I go to use every week it doesn’t mean to say that it wont be used and enjoyed. 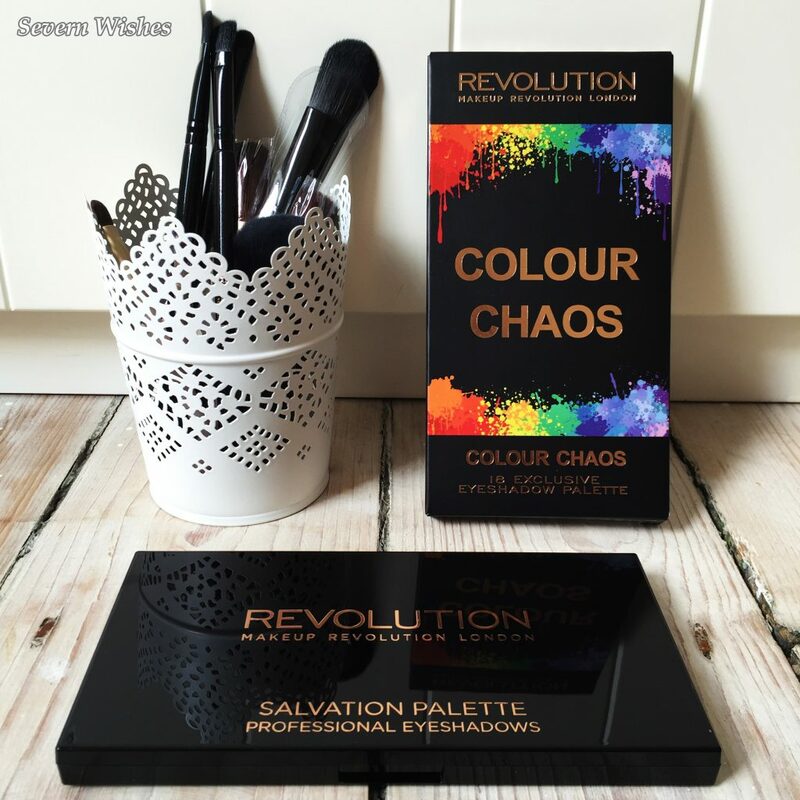 I hope you have enjoyed reading this review, and here is a link to the Makeup Revolution London website showing the palette for those who are interested in purchasing one. This entry was posted in Beauty, Fashion & Beauty, Makeup, Makeup Revolution, Reviews by Sabrina. Bookmark the permalink.